It’s all over the media…you’ve heard the tragic stories. Stories of teens and young adults ending their life after they’ve been bullied through social media sites. The consequences of cyber-bullying are very real. So I ask myself, why does this keep happening? We all know how damaging it is to spew hate across the internet, yet we continue to see it happen. Have you read nasty comments directed toward how someone looks when they post a picture on Instagram? Have you ever laughed along when you heard how someone pretended to have a crush on someone through text messaging, stringing them along until they deliver the crushing blow of …Are you kidding me, no one could ever really like you. Have you seen pictures of parties posted where someone was intentionally left out and then comments made about how they were so glad that person wasn’t there and would never be invited? Have you heard of a picture or video intended for one person suddenly going viral and ruining a reputation? I don’t need to give more examples. You’ve seen it, haven’t you? You understand how it hurts, don’t you? The pain and public humiliation that is inflicted through cyberbullying is as real as the emotional trauma experienced through real-lifebullying. The biggest difference between the two is real-lifebullying often ends when school ends, but there is no escape from cyberbullying. And here’s what really concerns me…most teens today base their value and their worth on how many likes, favorites, retweets, friends, followersthat they have. But what I want you to know…these things DO NOT determine your value. Your value comes in who you are as a person. How you love and treat others. And most importantly your status as a child of God who loves you completely just the way you are. 90% of teens who have seen social-media bullying say they have ignored it. 84% have seen others tell cyber bullies to stop. About 58% of kids admit someone has said mean or hurtful things to them online. More than 4 out 10 say it has happened more than once. Bullies get their powerfrom how their victim responds/reacts. Never respond to the cyberbully. Block the person who is cyberbullying you. They can’t hurt you if they can’t reach you. Take Action Immediately. 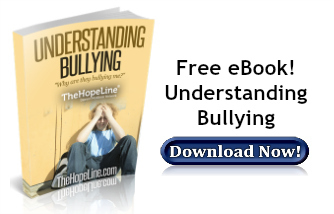 Often times, schools cannot help when it comes to cyberbullying because it’s happening after hours and is out of their jurisdiction, but school authorities are not your only hope to stop the various types of bullying. Keep the evidence of the cyberbullying (when it happened and what was said) and use this evidence to report the bully to the web & phone service providers. Cyberbullying often violates the terms and conditions of social media sites so ALWAYS report any abuse happening so they can take action against the user abusing their terms.